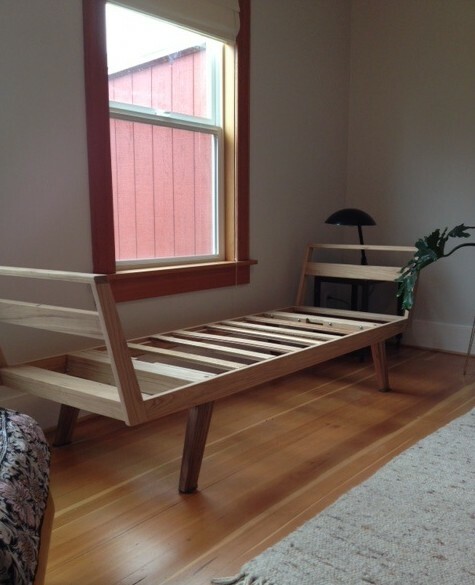 We’ve almost wrapped up our couch project – the frame is complete (hooray! ), but our dining room is buried beneath huge expanses of fabric, frayed and ripped upholstery thread, and the salt of a thousand tears. For today I thought I’d show you some of the inspiration behind our couch. But first? A confession. Do you remember back in September when I shared photos of this floral couch? 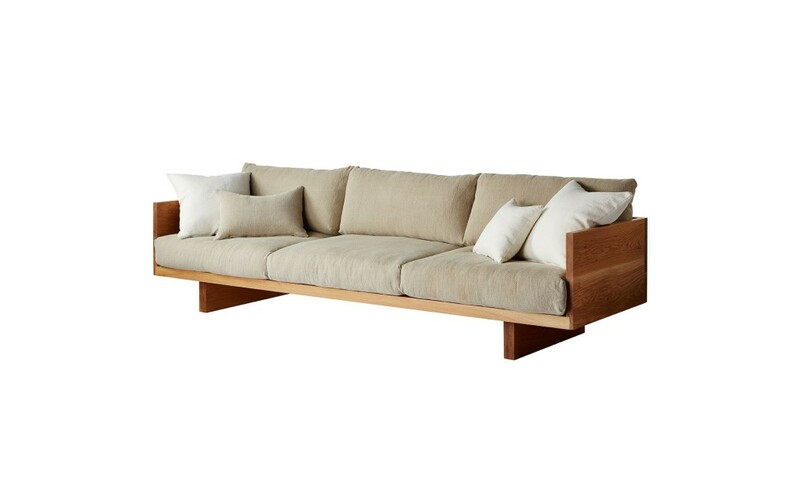 The couch that lost us a number of Instagram followers and was much maligned in the comments? At the thrift store, we removed the cushions – dislodging a bounty of used tissues, pet hair, other hair (oh god) and assorted debris – and hefted that sucker into the truck. Have I mentioned that it was our anniversary and that we were leaving on a trip and had a to-do list a mile long? Wood may be the traditional fifth anniversary gift, but I commemorated ours with a large, dirty couch that, according to Instagram, conjured up images of culottes, the 1980s, and too many cats. You see, dear readers, I was going to dazzle you with my incredible makeover skills. If only the couch would have fit through our hallway, or the window we tried to cram it through, I’m very sure I would have succeeded. The couch went back to the thrift store, and I did my best to move on. 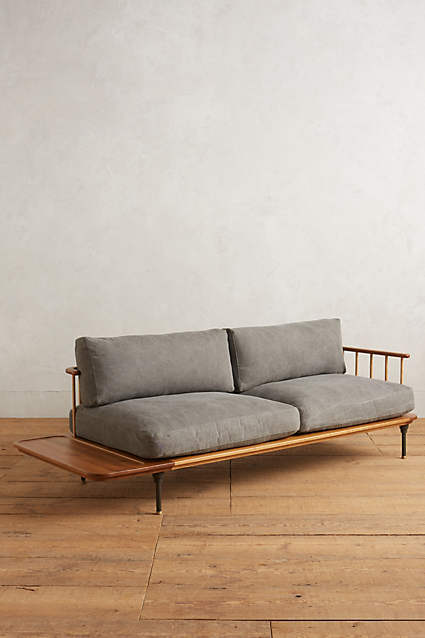 I couldn’t find anything I liked in the dimensions we needed (etched irrevocably in my brain after le soFiasco) at my usual haunts, but I saw this beauty on Anthropologie and thought, with my usual delusional confidence, pffft, we could totally make that. And so it began. 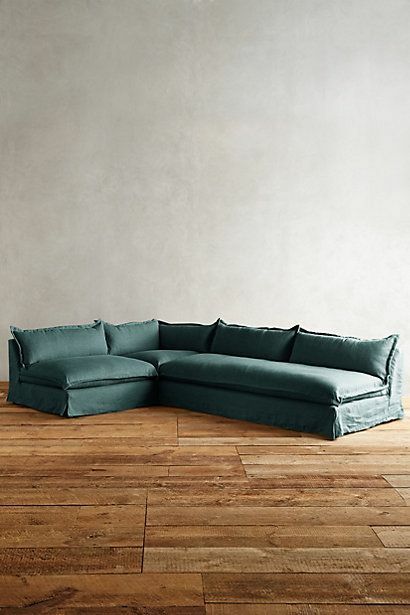 I had an initial gut reaction to that Anthro couch, but when I wiped the hearts from my eyes and really looked at it, I realized it wasn’t totally practical for us. I decided maximum lounging potential required two armrests to lean against, and more of an angle on the back. 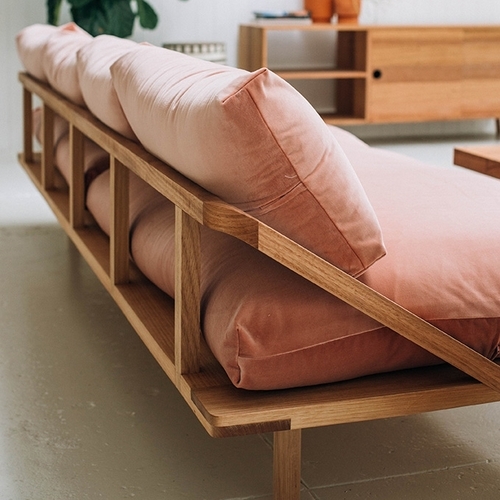 I really loved this one by Australian designer Mark Tuckey, but decided it would be a lot of wood in a room that already has wood floors and wood trim. 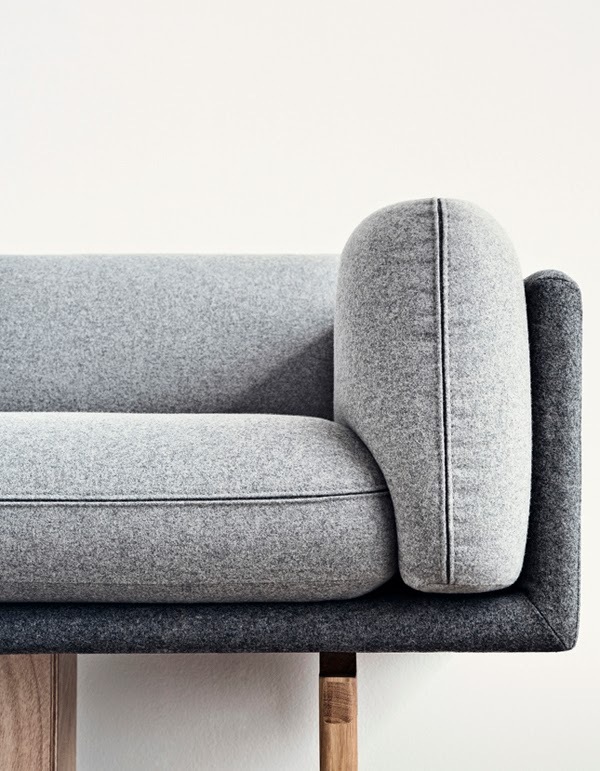 This dreamy sofa by Pop & Scott has neither arms nor back, yet I almost managed to convince myself that it was perfect. 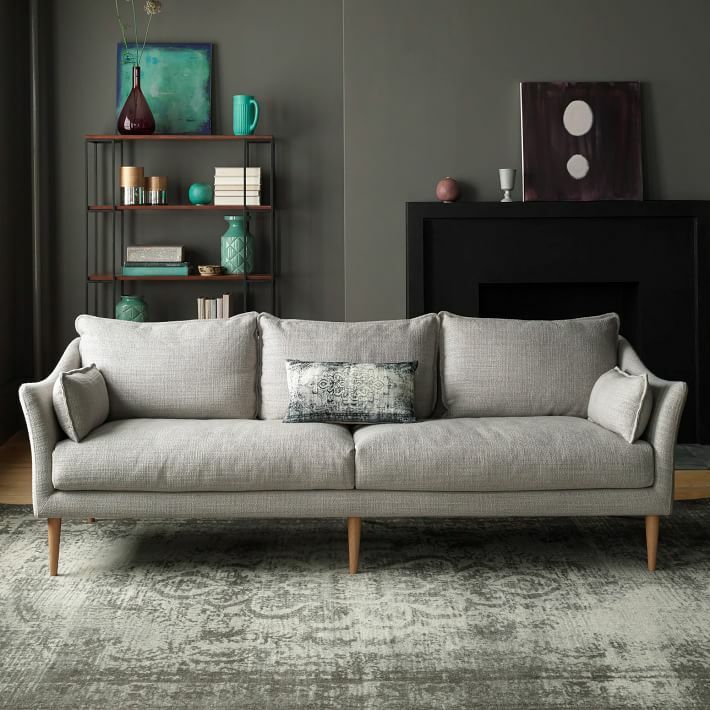 The couch we kept coming back to, and ultimately the one we based much of our design on, is this one found over on Italian flooring site Marazzi. 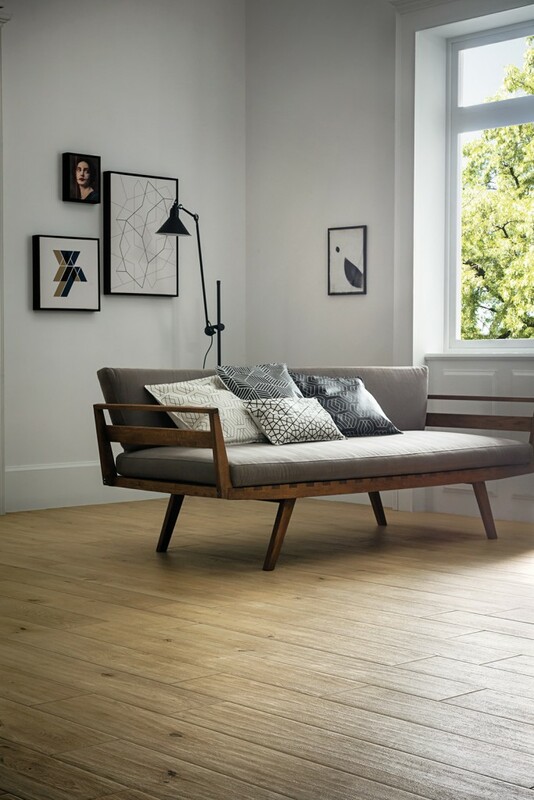 I loved the flare of the arms and the simplicity of the style, and figured we could up the comfort factor with deep cushions. There’s something very appealing about the insouciance of flanged cushions (maybe because it looks like they’ve been moved from the bedroom to the couch? ), and I gave them some serious consideration. Thanks for providing me with distraction (please send me some sewing mojo!) and for reading along, and have an excellent week! I love the frame! Super excited to hear about it as things progress. I can’t wait to see how this turns out! The frame is already really impressive–it looks *just* like your inspiration. I am sending you sewing mojo for sure! I’m hoping that you like to sew. I’ve upholstered a couch and a handful of chairs, and I have to say, I’ve had some of my lowest moments at the sewing machine. The kind where if you were a cartoon, your speech bubble would be filled with only special characters, lol. I think my favorite cushion is the gray one with the single seam, though I confess I have no idea how that was put together. Every option is totally chic, though, so you really cannot go wrong. I’m bummed with you that the floral couch did not work out. I really would have liked to have seen what you did with it. 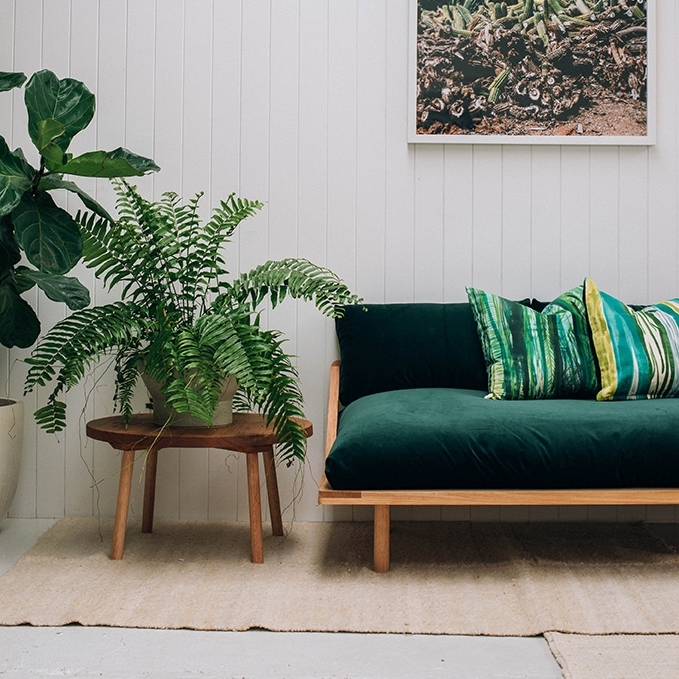 I bought a similar couch with questionable upholstery (though mine was 90s fabric that really couldn’t be reinterpreted as any kind of retro chic by the most creative imagination). I drove it an hour out of town to a rural upholsterer in order to get it recovered within my budget. The things we do for a good couch. And yet–worth it. I’m sure this project will be too! I like sewing? I think? But I’m never as good at it as I think I am when I’m planning these projects. Your blue couch is one of my faves! Good couches are hard to find, that’s for sure. Sorry the floral one wouldn’t fit, and that you had to find out on your anniversary! The new one will be so clean. You’ll love it. So fresh and so clean! I’m excited. Katie, while I understand the reaction to the thrift store sofa, I think it was possible to make it work. Every time I see it, I think of this house tour: http://www.lovelylife.se/blog/homevisits/hemma-hos-annacate/ There, the wallpaper was the flowery element that they built around. You would have had sort of the opposite situation going on, where your bold floral element was the upholstery. That said, I also think it’s a mistake to try to force something, especially if you have to decorate a whole room around that element! So maybe, in the end, the couch not fitting was for the best. Your new couch is looking so good, and I am in awe of the fact that you are doing the upholstery yourself. Can’t wait to see it finished! Thanks for sharing that link – I looooooooooove that house! I’m sorry I didn’t get a chance to at least try and make it work (the vibe in the tour you shared was exactly what I was going for). 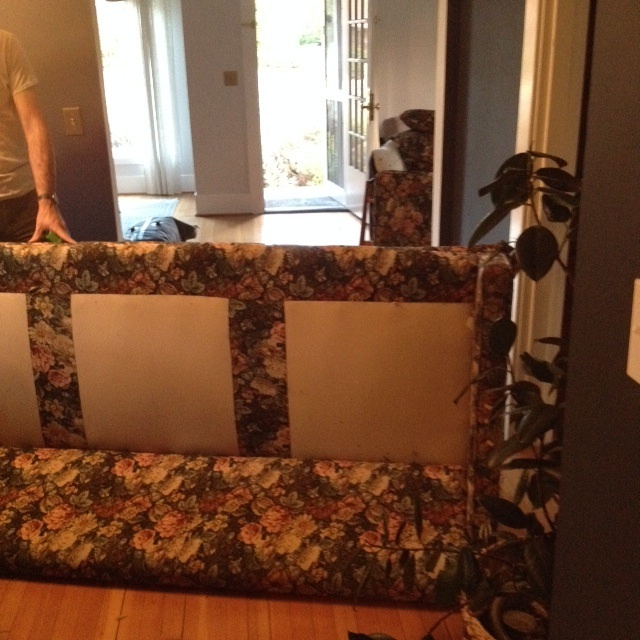 Katie—I have to say that I’m glad the floral couch didn’t work out (though sorry you had to go through moving it, etc.) because your new couch is totally inspired! So looking forward to seeing the finished product! Thanks Michelle — I’m glad too (or I will be when the sewing is done)! You are amazing! Tons of sewing mojo coming your way, but doesn’t seem needed! No Katy, I desperately desperately need every ounce of sewing mojo I can get. Thank you! “Wiped the hearts from my eyes” – my new favourite expression! I’ve made so many impulse purchases while the hearts were very much still in my eyes and have regretted it later… (I’m looking at you, giant wooden table lamp that’s too big for all my tables). Hilarious that you secretly bought the ugly sofa… I for one am glad the universe stepped in to physically bar it from your house! 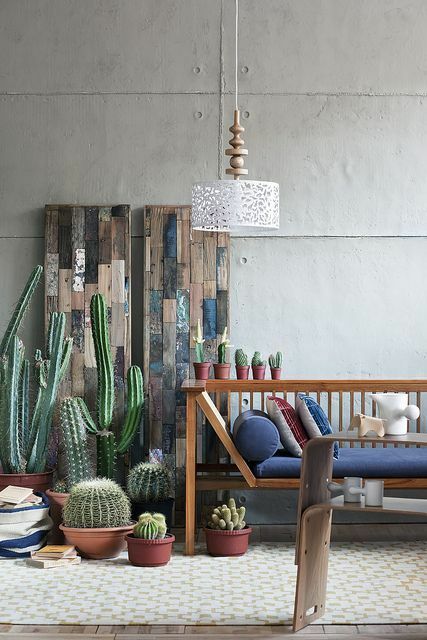 Hugely impressed that you’re making your own sofa – sending all the good vibes. Loving the frame of your sofa and1 the story behind the floral couch. So sounds like something I would too! A tale of laughter and tears. That frame is gorgeous! I was hoping you’d give us a sneak peek of your chosen fabric unstitched. We’ll just have to wait for the full reveal. But full marks to you for the craft of this story. love seeing your design process. this couch is going to be lovely. you can do it, seamstress!